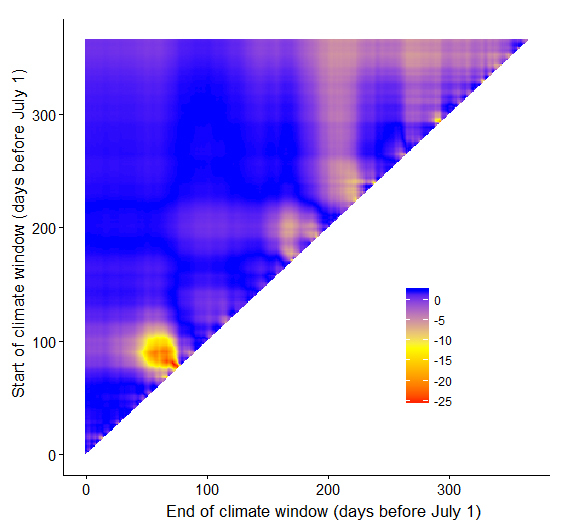 climwin is a statistical package designed for R to carry out climate window (or climate sensitivity) analysis on large biological dataset. Our methodology employs an exploratory approach to test and compare the sensitivity of a biological trait to the climate over a wide range of time periods. We hope to remove the need for researchers to select an arbitrary a priori period over which to study climate (e.g., mean spring temperature). I’ll be uploading video walkthroughs, blog posts and updates on the climwin package below, but to get started please see our introductory help file. I'm an ecologist interested in the impacts of climate change and how we might apply this understanding to conservation. My Ph.D. focused on the impacts of changing flooding patterns on a long-lived species of shorebird. I am currently undertaking an Endeavour Fellowship at the Netherlands Institute of Ecology (NIOO-KNAW).